By giving up the game-winning goal with 0.6 1.3 seconds left in OT to the Anaheim Ducks on Sunday, the Vancouver Canucks extended their winless streak to 4 games. And it doesn’t get any easier tonight as they face the Pittsburgh Penguins, who lead the NHL’s Metropolitan Division by 17 – yes, 17 – points and have won 15 of their last 18 games. Oh yeah, and the Penguins just got Evgeni Malkin and Kris Letang back from injury. Tonight’s game marks the first of the Canucks short, two-game home stand before going back on the road for 4 of their 5 games. 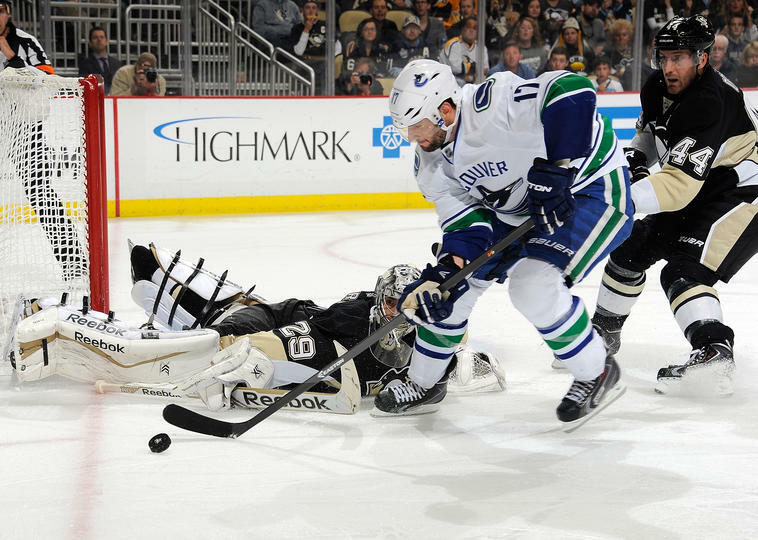 It is the second and final regular season meeting between the Canucks and Penguins. The Penguins won the first their first meeting in Pittsburgh in the shootout by a 4-3 score. Daniel Sedin assisted on all 3 Canucks goals against the Ducks, and now has 6 points (1 goal, 5 assists) in his last 5 games. Ryan Kesler has scored a powerplay goals in each of the last 2 games. Unsurprising given their record, a few Penguins are on hot streaks right now. James Neal has 12 points (6 goals, 6 assists) in his last 5 games. Sidney Crosby is on a 5-game point streak with and has 9 points (3 goals, 6 assists) in that span. Malkin, who has been out since December 14th, scored twice and added an assist in his first game back on Sunday against the Jets. Injuries and injuries and injuries for both teams. Luongo (ankle) remains day-to-day for the Vancouver Canucks along with forwards Chris Higgins (flu-like symptoms) and Zack Kassian, who got injured on Sunday against the Ducks when Tom Sestito accidentally got his skate up to his face. Defensemen Andrew Alberts (concussion), Alex Edler (lower body) and Ryan Stanton (ankle), and forwards Jordan Schroeder (ankle) and Alex Burrows (jaw) are on injured reserve. Is Ryan Kesler Back to Selke Trophy Form? Previous story #HockeyTalks: Will You Listen?